You’ve Got To See Iron Man Dress As Snow White For Captian America! The year-long wait for Endgame has indeed seemed endless for us Marvel fans. But luckily, it has been peppered with some juicy tidbits and endgame reveals by the uber-talented, star cast. This time around, it is Iron Man and Captain America’s bromance that is in the news! Robert Downey Jr and Chris Evans won’t stop giving us friendship goals. Their on-screen sparring in Civil War is clearly nugatory and their camaraderie off-screen proves it. Downey recently shared a post on Twitter tagging Evans. This very special post saw Iron Man turn Disney princess for Chris. What’s more is that Robert begged Chris to be his prince charming! You’ve got to see the Twitter exchanges between the stars! Let’s begin with the picture in Downey’s tweet. 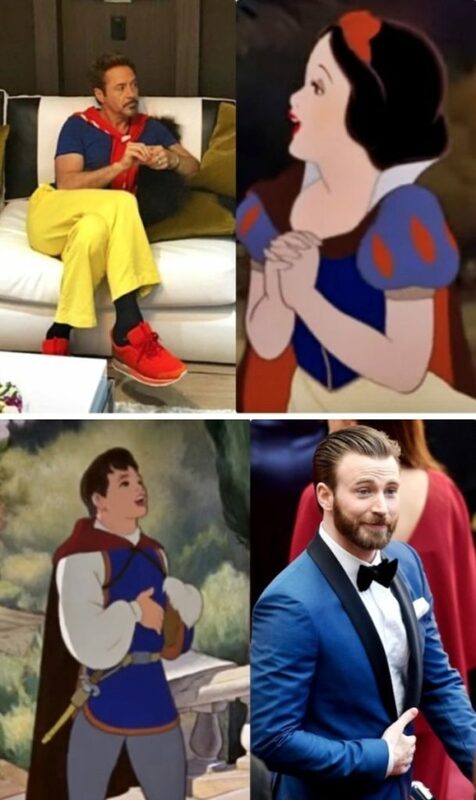 You can see Robert dressed as Snow White in a meme with the Disney Princess. Evans, on the other hand, is clearly meant to be Prince Charming. Chris’s reply shall have you ROFL. Their exchange went viral prompting adorable reactions and a spate of memes from Twitterati! Here are Downey and Evans in Hercules! Perhaps you prefer their bromance in Toystory? Take a look at some more fan-made Disney-Marvel memes! Gosh, this fan wonders when they’ll put a ring on it! Could you picture a better superhero coupling? Not a chance unless you’re thinking Hulk and Thor!